Sullivan's Smart Feed Scoop [SCOOP] : Highland Livestock Supply, Ltd, Products for all of your show animals! Sullivan's Smart Scoop will change the way you think of feed scoops. This scoop is made of the highest quality, most durable plastic on the market and was designed with the user in mind. The scoop has a comfortable rubberized handle for an anti-slip grip. It is also comes equipped with a first of its kind thumb groove that allows you to get the best grip without the discomfort you receive from other scoops. 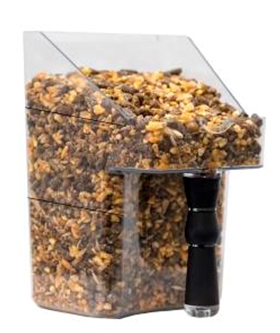 Lastly, the clear plastic body with measure lines allows you to easily and more accurately measure out feed resulting in consistency in your feed program.